Pick the classic styling of the Kingsley-Bate Cape Cod collection and relax in comfort. 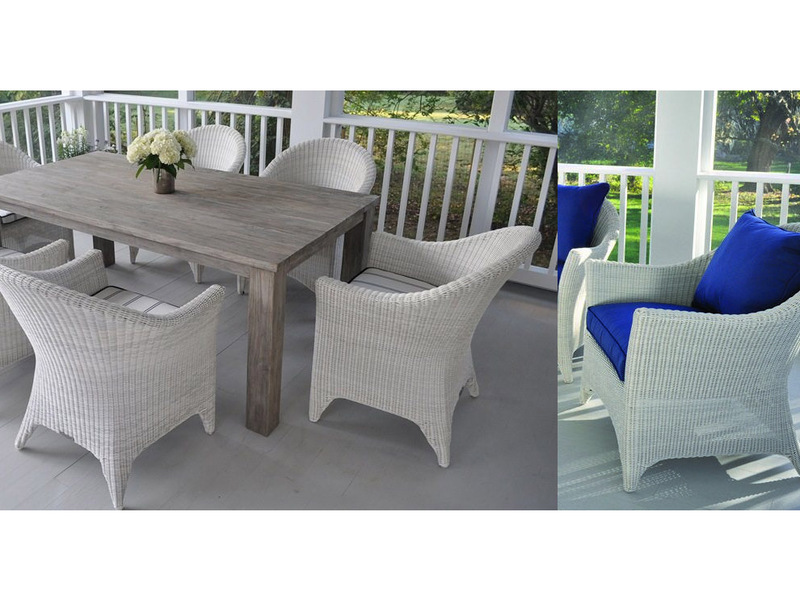 Cape Cod is an updated, more sophisticated version of classic wicker porch furniture. The chaise is constructed from all-weather wicker and a rustproof aluminum frame, allowing it to be used outdoors, completely exposed to the elements. Chaise features a four position adjustable backrest and integrated teak wheels. With its elegant sweeping lines and fully woven frame, our Cape Cod lounge chair is an updated, more sophisticated version of classic wicker porch furniture. The lounge chair is constructed from all-weather wicker and a rustproof aluminum frame, allowing it to be used outdoors, completely exposed to the elements. Ships fully assembled. With its elegant sweeping lines and fully woven frame, our Cape Cod swing is an updated, more sophisticated version of classic wicker porch furniture. The swing is constructed from all-weather wicker and a rustproof aluminum frame, allowing it to be used outdoors, completely exposed to the elements. Rope and height adjusters included. The Cape Cod collection by Kingsley Bate is great for any time of the day in any setting indoors or out. The weather resistant wicker and rustproof aluminum frame makes it an easy to care for pieces that will look great for years. The soothing comfort of this chair is accentuated by quick-drying back and seat cushions that come in dozens of Sunbrella fabrics to match any decor. The Kingsley-Bate Cape Code collection is stocked in Natural and White frame finishes for quick shipping. Additional frame finish colors available with an extended lead-time. Please call for details. Over 65 solution-dyed acrylic fabrics are available for the all-weather seating cushion. Customer’s Own Material (COM) accepted. Please inquire for additional details. Review the Kingsley-Bate Catalog for the complete Kingsley-Bate outdoor furnishings and accessories. Questions regarding furniture cleaning and tips can had by contacting us. Turn your outdoor space into a true oasis with fine Kingsley-Bate furniture. Kingsley-Bate is America’s leading manufacturer of teak outdoor furniture. The designs are made to withstand the rigors of changing weather while maintaining its beautiful appearance. The furniture is made of premium quality teak or all-weather wicker and is constructed to meet the highest standards. Kingsley-Bate is committed to environmental responsibility. The outdoor furniture and umbrellas use Javanese teak from environmentally secure sources to help combat deforestation in the world’s rain forests. Our wood comes from carefully controlled plantations which ensure equal reforestation and limited felling. A small amount of high-quality Burmese teak is also used in production. In most designs, the natural beauty of the wood is the center of attention. Clear finishes, natural colored fabrics and simple lines help to highlight the color and grain of the teak or wicker used in the piece. Matched sets and individual pieces are available to suit your needs. Kingsley-Bate outdoor furniture designs were listed as a top seller in Casual Living Magazine. The line of umbrellas, patio furniture, planters and benches can be found in upscale homes, restaurants and hotels throughout the world. Enjoy world-class style wherever you please by choosing Kingsley Bate-furniture from AuthenTEAK.